The picture tells it all .. here it is 13 all after 81 minutes.....looks like jelly legs too. Photo credit to Tyler Nimick, Boston. depends on the length of the points. Isn't the barrier to aerobic around 45 seconds of anaerobic activity? I definitely have a lot of points that my lungs don't feel, but there are occasional points or players that push me aerobic. If you know someone has no lungs, just get the ball hot and keep the point going. 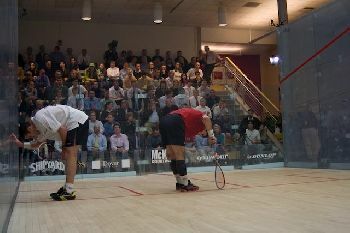 Squash does require the training of both aerobic and anaerobic systems for sure. These players in this photo would have trained for years and have reached their limit in this match after 81 minutes. The big factor too is the hard matches have come back to back at this intensity taking their bodies to their limit over several days. Study the draw and time frame for this tournament where Palmer lost to Willstrop in 95 minutes in the final; what a let off for Willstrop when his opponent retired injured in his semi - but no such luck for Palmer. It all comes at a cost too. I read that first reply as a caption for one of the players! "A pint would be great in the club room"
I'm a sprinter low to mid 11 seconds, and i think squash is definately anaerobic. But squash is a series of sprints, so you need some aerobic too. I know some marathon runners who play, and when the pace gets pace, they just can't get to (i.e cannot sprint to) the ball. so although they can run all day, if they can't get to the ball, it's over real fast. if one wants aerobic fitness, continuous slow running is probably better. A print would look great in the club room.